To Be sewn onto item after braid or trim knitted. 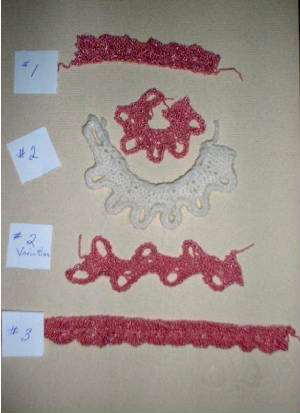 -**Counting from Right, pull needles 4 and 5 to hold, (set carriage to hold) Knit 4 rows. -Return needles 4 and 5 to work(upper working position so they knit on next row) and put needles 2, 5, and 6 into hold and Knit 6 rows wrapping needle 6 each time carriage is on that side. -Repeat from ** to ** to desired length and bind off. Variation (not shown)...do not knit 2 rows between needle changes. Yarn...your choice, Tension, use same tension you would normally use for the yarn. -**Pull needles 3, 4, 5, 6 (counting from Right) to hold, set carriage ot hold, and knit 10 rows on remaining 2 needles (do not wrap needles in hold). This trim tends to curl naturally so might be easy to place on a neckline. Do proceedure as above, then on next loop, do it on the other side, by knitting 1 Row and then begin by placing needles 1, 2, 3, 4 (counting from Right) in hold, knit 10 rows, then returning 1 needle to work, knitting 2 rows and so on until all needles are back in work, then knit 1 Row and start at ** again. This method gives you a loop on both sides of the braid, does not naturraly curl, and has an interesting look. Purl side pictured, but knit side is interesting too. -Cast on 6 stitches, Knit 2 rows. -**Put needle #3 (counting from the right) in Hold (carriage in hold). Knit 3 rows. -Repeat from ** to ** as needed. Variations: Try more rows of knitting while needles are in hold...your yarn willl somewhat dictate how many rows you can do. Also, try more rows between each scallop for a different look too. This works nicely with any yarn, knit with a tension perhaps a little looser than you normally use for the yarn, experimenting is in order! -Place 8 needles into work, then push needle # 5 back (counting from the right side) inot non working position. Cast on over there 7 needles and Knit 2 rows. -**Place needles #3, 4, 5, 6, 7 in hold, (set carriage to hold) and knit 4 rows over the remaining 2 needles ( do not wrap needles). -repeat from ** to ** as needed. Bind off. Attach this binding flat, or fold over edge of knitting and attach as desired. -Instead of knitting only 4 rows on the 2 needles, try 10, or ???? Purl side is the right side. Consider this for bands around edges of coat sleeves and more! -Bring 11 needles into work, then push needles 4 and 8 back out of work. Cast on over the remaining 9 needles and Knit 2 rows. -**Pull the center needle of each set of three needles out to hold, set carriage to hold, knit 6 rows. -Repeat from ** to ** for length needed. Use this to give some chunky design to a sweater. You must pull on this trim after to removing from machine to get the design to "POP" out. -Pull 11 needles out to working position, then push back out of work needles 4 and 8. Cast on over the remaining 9 needles and knit 2 rows. -**Pull center needle of each group of 3 needles out to hold and set carriage to hold, and knit 4 rows. -push the above needles back to upperworking position and knit 2 rows. -Push needles # 3, 4, 6 and 7 into holding position, and knit 4 rows. WATCH TO MAKE SURE YOU DON'T DROP THE STITCH ON NEEDLE #5! Not sure where to use this but try it anyway! -Cast on 10 stitches and knit 2 rows. 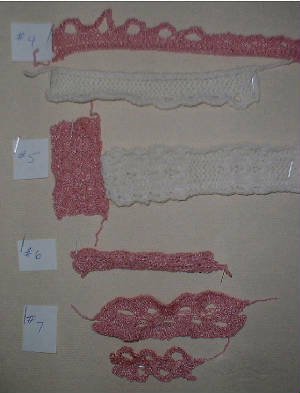 -**Put 6 needles on left side in hold position and set carriage to hold, knit 8 rows on the 4 remaining stitches. -Put the left 5 needles back into upper work, (leave the other needle still in hold), and knit 3 rows. -Put the right 6 needles into hold (include the one already in hold in this number) and knit 8 rows and the remaining 4 needles. -Repeat from ** to ** for length desired.